Photo info: I took this one over 20 years ago (remember before digital cameras?). I know this because that's my daughter on the left and her childhood friend on the right. Thought it would be fun for her. I love the quote she picked for today - makes me want to go find a swing. Swings are one of my favourite things and I've always dreamed of having a huge ceilinged room tall enough to have my own swing to read and dream upon.....for the moment I have to make do with our hammocks. Loving this picture is pure joy and childhood bliss. I love to swing with Abby at the park! I've been a little more cautious though ever since the time the seat broke under me and I fell off. Ouch! Love this photo! Hope we never forget how to fly. LOVE IT! Don't want to forget to fly or dance! Wonderful on both ends! Love seeing pics of little Meg! I want to fly! That photo is great and I like the pairing too. Of course I love it!!! Perfect pairing! this is so cute and adorable! Happy weekend! Oh precious girls! They grow up too fast. The Fashionista will be 23 on Wednesday. what a great picture!! she will love it. it looks like pure and simple fun! This is one of my all time favorite pairings!! 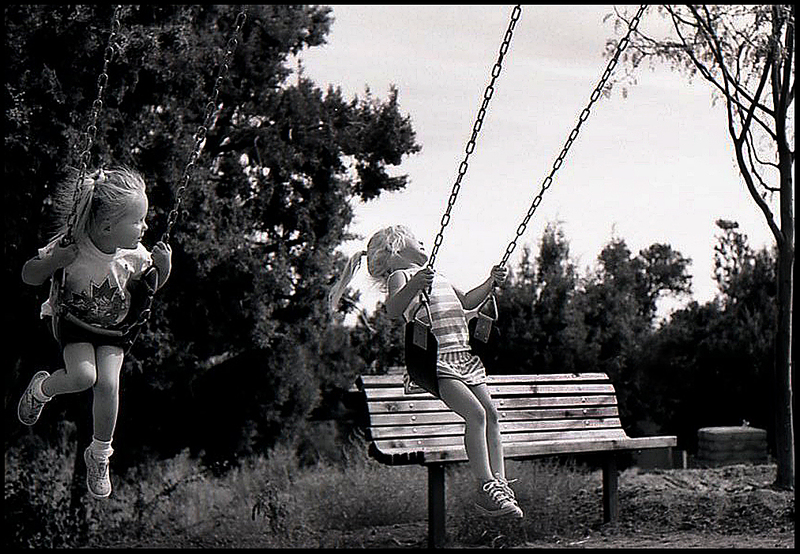 Love the fabulous shot - you capture the essence of childhood summer. And the quote is so poignant - so sad that we all have to grow up and lose the innocence and imagination of our youth!